A Delicious Butter Chicken Recipe. Butter chicken recipe, also know as chicken makhani can be rated in the top most Indian chicken curry recipes. It's popularity around the world is rightly justified by it's taste. 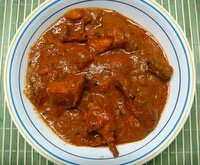 I have listed here two ways to prepare chicken makhanwala. The basic gravy for both variations is the same. Although, the name of the recipe itself suggests the use of butter in it but I don't add too much butter in it. Don't worry, the taste won't get compromised. You can use chicken on the bone for this (no need for boneless or tandoori chicken, although you can use if you want). Mix all ingredients so that all the chicken pieces are coated well. Leave this covered for 5-8 hours (ideally, prepare it the night before and leave in the refrigerator). Make a paste of onion and green chili by using very little water. Also blend the tomatoes and fresh coriander separately. Heat a non-stick heavy bottom pan, add the butter and oil. Add the cloves, cardamom, cinnamon and bay leaf. When they crackle add the onion paste and saute on a low to medium flame. When it starts to brown a little, add the ginger-garlic paste. Saute on a low flame till almost dry and the paste looks golden brown (make sure the flame is not on high, if the onion paste gets burnt, then your gravy will taste bitter). Add the tomato puree and on a high flame cook till all the water is evaporated. Add the tandoori masala, salt, chili powder and coriander powder (the tandoori masala contains salt too, so don't add too much salt at first). At this stage turn off the heat and give your masala (what you have just prepared) a touch of Smoky Aroma. Put it back on the stove and tip in the marinated chicken along with the marinade. Bring to a boil, add the color and cook on medium heat till the chicken is almost done. Stir occasionally. Crush the kasoori methi and sprinkle it in. Also add the cashews. Sneak a taste and add more salt if required. Cook further till the chicken is completely done. Kindly note:- If the chicken pieces are small and tender then do not put the lid on while cooking, otherwise your chicken will get cooked and the gravy will still be watery. The gravy should be thick, not watery (although we are not adding any water, there will be water in the chicken and yogurt). If the pieces are bigger and tough then do put the lid on. They will need some steam to cook. You can always adjust the thickness of the gravy by adding hot water, if needed. Lastly, if you want to do justice to the name of this recipe, then add some unsalted white butter and garnish with fresh coriander leaves. I personally avoid that because I don't miss it. To give an extra smoky aroma, before you add your marinated chicken in the masala, smoke it the same manner as you did the masala. This will put that aroma in the chicken too. I hope you like this butter chicken recipe. It really comes out nice. For this butter chicken recipe you need to begin with a ready made tandoori chicken. Tear as much boneless meat as you can from it. Discard the bones. Make the gravy in the same way and add this chicken when the gravy is done. Do not add the tandoori masala as your chicken will already have it. Also no smoking required. Adjust the quantity of the gravy, according to the quantity of the chicken.